The resorts, hotels and holiday apartments that are featured on Ozhotels are all completely independent of each other and provides holiday makers with affordable places to stay in the tourist destination of Burleigh Heads on the Queensland Gold Coast. You will be able to deal directly with the apartments and resorts on Ozhotels in order to find the best possible rates available. So save money by booking your next holiday accommodation in Burleigh Heads online and get real value for your money. Not matter why you are travelling to Burleigh Heads on the Queensland Gold Coast you will discover that there is a large variety of fully self contained holiday apartments, resorts, hotels and motels available for you to choose from. With such an extensive range of accommodation in Burleigh Heads it can be a very time consuming and tedious task to get the most appropriate place for your specific needs. Therefore many people use the free services of an accommodation expert like OzHotels in order to help them get a place that suits their travel budget. The main benefits of booking online with OzHotels is that you can compare hundreds of properties located right around Burleigh Heads, you can book up to 12 months in advance and that you will receive an extra discount off the already cheap rates when you stay longer. The next time that you are in need of a place to stay in Burleigh Heads you can save yourself time and money by booking directly with an accommodation expert like OzHotels. The Burleigh Point Apartments are absolute beachfront and offers holiday makers fully self contained apartment accommodation on the white sands and warm blue waters of magnificent Burleigh Beach. 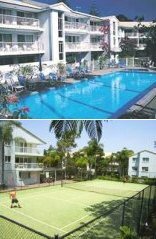 Burleigh Point Apartments is a three storey complex located on the Esplanade of the Gold Coast North Burleigh, offering self contained accommodation in a family setting. 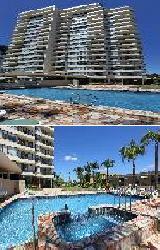 Burleigh Point Apartments features spacious 2 bedroom fully self-contained apartments, all with garden or ocean views. 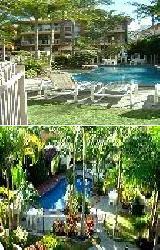 This Burleigh Heads resort also offers a swimming pool, heated spa, playground and BBQ area. Burleigh Point Apartments is only 30 metres opposite the beach, and offers easy access to trendy cafes, restaurants, major shopping centres, 9 golf courses, theme parks, Coolangatta airport, Jupiters Casino, Currumbin Wildlife Sanctuary, Broadbeach & Surfers Paradise. The modern 1, 2 & 3 bedroom self contained apartments at the Burleigh Surf Beachfront Apartments are ideally positioned along the picturesque Esplanade in Burleigh Heads, only a short stroll from one of the Gold Coast's most awesome beach and surfing playgrounds, Burleigh Beach. The Burleigh Surf Beachfront Apartments boast magnificent ocean views and is close to everything that the Gold Coast has to offer. It also has numerous guests facilities and services including direct internet access, free car parking, gym & fitness equipment, lift, sauna, outdoor swimming pool, tennis court, tour desk, bbq, garden, indoor pool, baby cots available, a games room with billiard table, internet kiosk, bicycle rental, vending machines and wheelchair accessibility. 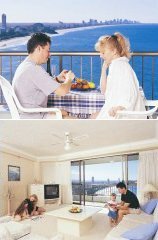 The Burleigh Gardens North Hi-Rise Accommodation provides holiday makers with a choice of 1 & 2 bedroom self contained serviced apartments in the heart of the beautiful Burleigh Heads. Providing affordable yet modern accommodation, Burleigh Gardens North Hi-Rise Apartments are located in the heart of Burleigh Heads shopping and dining precinct, opposite a bus stop, offering easy access to all attractions on the Gold Coast. The Burleigh Gardens North HI Rise in Burleigh Heads is close to everything that the Gold Coast has to offer, as well as having a numerous guests facilities and services including direct internet access, free car parking, lift, bbq facilities, landscaped garden, airport shuttle and baby cots available. There is an on-site tour desk that offers assistance in the purchase of theme parks tickets, shows, airport transfers, tours and car hire. When you choose to stay at the Southern Cross Apartments in Burleigh Heads you will be able to choose from a range of 2 bedroom self contained serviced apartments, all of which have remarkable ocean views. Perfectly positioned directly across the road from the magnficent Burleigh Heads patrolled beach, the Southern Cross Beachfront Apartments allows guests to enjoy all that Burleigh has to offer, like the surf, white sandy beaches, parklands, BBQs and many children's playgrounds. 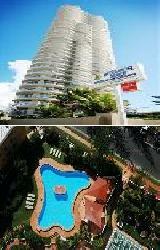 The Southern Cross Apartments in Burleigh Heads is close to everything that the city has to offer, as well as having a numerous guests facilities and services including direct internet access, free car parking, guest laundry, gym, lift, sauna, spa, outdoor swimming pool, tennis court, garden, airport shuttle, security and baby cots available. To ensure your holiday perfection, the Southern Cross Burleigh Heads Apartments Resort also has its own tour desk which offers discounted theme park tickets, tours and lots of helpful holiday information. Comfortable and very affordable holiday accommodation is what the Oceanside Cove Holiday Apartments provides you with when you choose to stay at this Gold Coast property. 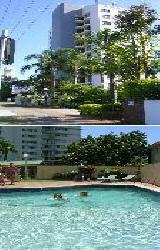 It is a low rise resort that is ideally amde up of a rage of self contained 1, 2 & 3 bedroom apartments. The Oceanside Cove Holiday Apartments is conveniently situated in the heart of Burleigh Heads on the Queensland Gold Coast and is just a short walk to the beautiful patrolle Burleigh Beach. The Oceanside Cove Holiday Apartments in Burleigh Heads is close to everything that the city has to offer, as well as having a numerous guests facilities and services including free car parking, guest laundry, outdoor usaltwater swimming pool that is solar heated in winter, tour desk, BBQs for guest use and landscaped garden. The Gemini Court Apartments Gold Coast are a beachfront, high-rise apartment building situated in the beautiful Burleigh Heads region. All of these fabulous Gold Coast accommodation apartments feature stunning ocean or beach views and a balcony from which you can enjoy the cool sea breeze in the evening. All of the apartments at the Gemini Court Burleigh Heads include a fully equipped kitchen, private laundry facilities, FREE cable TV, DVD players and much more. A short stroll from the Gemini Court Apartments is the pristine Burleigh Beach, Burleigh National Park, shops, restaurants and cafes. The twin towers of Gemini Court Apartments offer unforgettable Burleigh Heads accommodation in a fantastic beach front location. 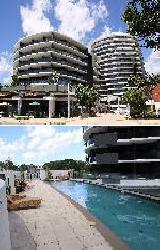 For more Burleigh Heads Apartments click here. The Paradise Grove Holiday Apartments on the Gold Coast are ideally located in Burleigh Heads, just a short stroll to the beautiful, patrolled Burleigh Beach and National Park with its many BBQ areas and childrens playground. The affordable family accommodation at the Paradise Grove Apartments in Burleigh Heads is fully self contained and offers holiday makers complete relaxation whilst still being close to all of the Gold Coast's major tourist attractions. 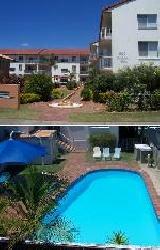 At the Paradise Grove Holiday Apartments there are 2 outdoor swimming pools, an outdoor spa, 3 BBQ areas, FREE security car parking for each apartment and a licensed bar and social club onsite. Nearby to this cheap Burleigh Heads accommodation are the many delicious restaurants, cafes & shops that Burleigh Heads has to offer. Burleigh heads is a picture of natural beauty with sandy beaches, sparkling turquoise waters and pristine parks lined with Norfolk Pines. The Ambience Holiday Apartments Resort at Burleigh Beach offers one, two and three bedroom self contained apartments surrounded by all of this natural beauty. This Gold Coast accommodation is situated opposite the prestigious patrolled Burleigh Beach and features apartment interiors with luxury furnishings and large, flowing living spaces. Guests of the Ambience Holiday Resort can relax and rejuvenate themselves in the spa, sauna or steam room. The more health conscious guests can make use of the fully equipped gymnasium and heated 25 metre lap pool. Although the apartments are fully self contained guests are still able to make use of the barbecue facilities at the resort, which looks out over stunning north east views of the beach. When you stay in this Burleigh Heads accommodation relax with a sunset walk along the beach or take a stroll to the Burleigh Heads National Park and marvel at the spectacular views of the Gold Coast skylinefrom there.